The precise construction of the American Made Modern Platform Bed is evident at first glance. And it'll become even more obvious the first night you spend sleeping on this high quality platform bed. 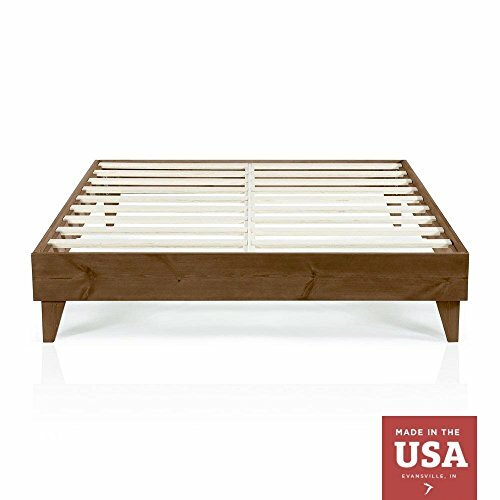 This bed is completely hand crafted in the United States and can hold up to 900 pounds. The solid wood unit provides a classic design featuring a walnut stain on North American Pine. Once the unit arrives at your home, construction couldn't be easier! One person can put this platform bed together in less than 4 minutes with no tools required. MADE IN AMERICA - You'll appreciate the hand-made construction of this platform bed, which is a proudly made in the U.S. If you have any questions about this product by Cardinal & Crest, contact us by completing and submitting the form below. If you are looking for a specif part number, please include it with your message.